“btn-group-justified”, “center-block”, “btn-group-centered”. unfotunately it does not succeed. 3.In Bootstrap using this buttons, the background color is white, and the pressed button is gray (see image), when copying the code to my pen neither the background color neither the functionality are the same. You’re currently using bootstrap 4. Try changing to bootstrap 3. Thanks! This solved the problem. I am facing a new bootsrap problem though, I hope you can help me with. Generally, when you use the btn class, you also use another class such as btn-primary or btn-default (this one is what I think you want). Then you can remove the background color you set for the .btn elements in your CSS. Going one step forward I face a new Bootstrap challenge. I’m trying to control the active background color of the buttons. I managed to control the hover background color using the :hover pseudo class, but I fail to change the active background color using the :active (or .active) pseudo class. 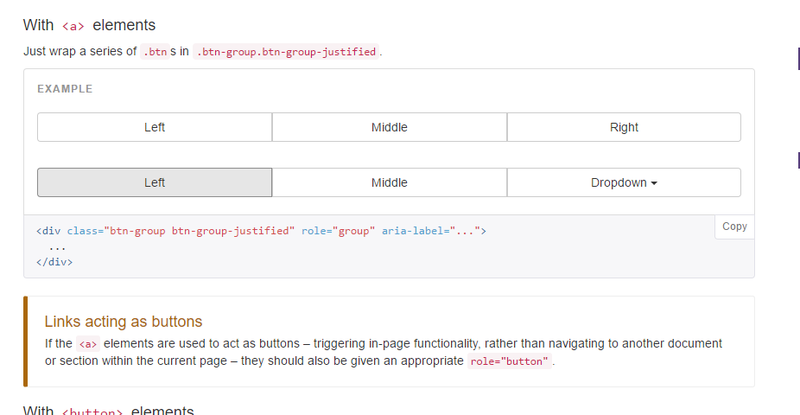 Looking at the Bootstrap documentation there is a section for customizing Bootsrap, and in there for customizing buttons, but I’m not sure how to do that (see image). I’m not sure how do this. Perhaps using @btn-default-color? If so how do I use it and where?). You may also advice about how to advance my skills with Bootstrap. Also, when the viewer is less than the page width (which I defined as 1100px using max-width property on the body element), there is no side margins, even though I defined a 1 em margin to the body element. Can you explain? I haven’t used getbootstrap.com/customize, but I think it allows you to create your own bootstrap theme (say you want btn-primary to be colored red instead of blue). But I don’t think you can readily use your custom version with codepen. in there for customizing buttons, but I’m not sure how to do that (see image). I’m not sure how do this. Perhaps using @btn-default-color? If so how do I use it and where?). Have you seen this playlist? I just now understand that the customization option means to make changes before u download. Lol. I found a solution for the buttons background. I needed to use the focus pseudo class.